Data from Statistics Estonia show the consumer basket was 2.8% more expensive in March than a year earlier. The price level did not change from the previous month. Food price inflation reached 5.1% in March, and 1.7 percentage points of that came from the higher excise rates on alcohol that came into force this year. 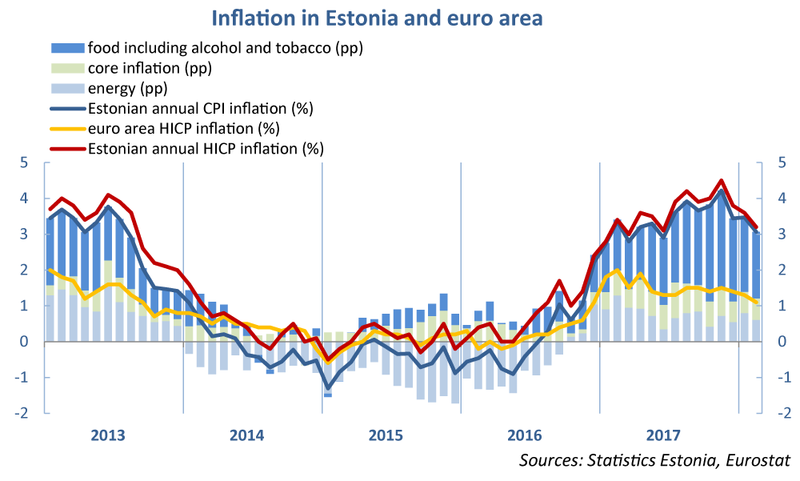 Although food price inflation has slowed a little in Estonia in recent months, its rate is still one of the fastest in the euro area. Food prices in the euro area rose by only 2.2% in March. Food price inflation affects poorer households particularly as primary consumption goods make up a larger share of their consumer basket. Food products fill 36% of the consumer basket of households in the first income quintile, who have the lowest incomes, while the richest households spend only 24% of their income on food. Housing costs are the second largest share of the consumer basket and inflation for them accelerated to 4.2% in March. Housing costs were pushed up by a rise of 8.5% in rents and of 10% in the price of electricity. Inflation has been restrained somewhat in this heating season by the level of heat energy prices, which has remained broadly stable. Data from the business survey of the Estonian Institute of Economic Research indicate that services could start to contribute more significantly to inflation in the coming months. Economic growth in the external environment has gained momentum since the last year, posing a risk of accelerating inflation. Some of the largest central banks outside the euro area have already decided to raise their monetary policy interest rates. Economic activity has also picked up in the euro area countries, but this has so far had only a weak impact on prices. The price of the consumer basket in the euro area was up 1.4% in March according to initial estimates.